The aim of this page is to give you an owners impression of what Berkeley's are all about, it has been compiled from submissions by my feedback page and from personal emails. If you have a story to tell then why not complete a feedback submission or send me an email to "berk at pearsy.co.uk" (replacing the 'at' with the @ symbol, this is an attempt to stop web robots sending me spam emails). Finally got the Berk - Rotax finished and running so entered the Shelsley Walsh Hill Climb on Sept 12th and managed 54 seconds compared to 998cc mini cooper at 50 secs so not bad. Running with incorrect gear ratios ( calculated at 138mph top gear) which slowed me a lot up the damn great hill!!. Looking to get down to 43 secs. next year. Could also do with a sequential box, the gate takes time. Attach photo of Berk off the line, 1st Berk in known history to go up the hallowed hill. The car caused great interest from all other drivers, including Lotus F1, Ferrari owners all owning up to have started their driving in a Berk. So going for a full year next year and the winter to sort out remaining problems. Please look here for further information about this car. My father, also John Williams, bought the Berkeley around 1960. He was a design engineer for a small steel fabricating company, so was intensely interested in all things mechanical. He was well known for buying off-beat autos, enjoying them for a year or so, and then moving on to something else. In 1949, he bought a Ford Anglia, later a Renault Dauphin, a Porsche 356B, several kit cars, a Triumph TR-3, Mazda RX-7, etc. However, the car I most enjoyed (and I think he did too) was the Berk. It was the two cylinder version, so performance was not startling. However, it was a guaranteed head turner in our small city of Waco, Texas. Below is an old photo of my father and me in the car, both of us grinning widely, click on the picture to get a better view. The Berk was very reliable, with some fibreglass cracking being the only problem we had, my dad easily repaired it. It was great fun to drive, of course, and several young ladies in Waco had their first sports car ride with me. 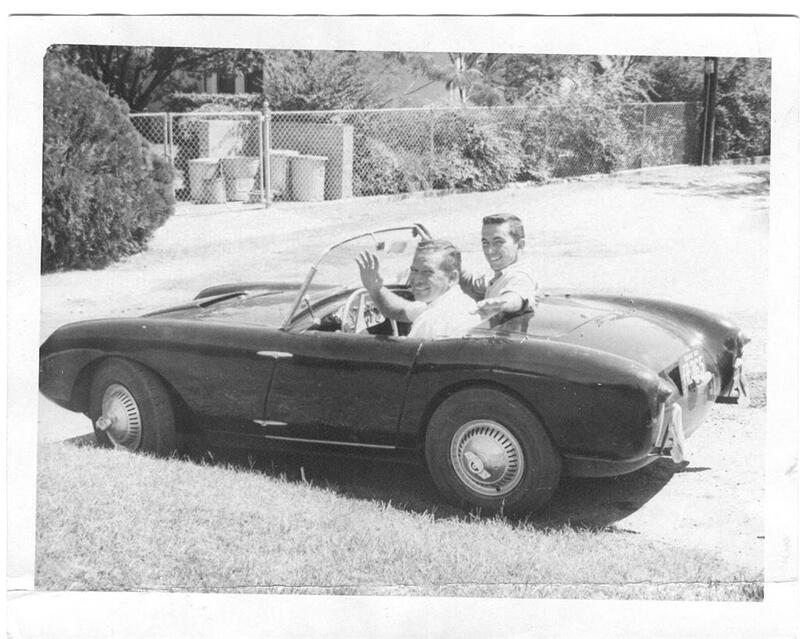 My good friend had an Austin-Healey Sprite (frog eye, called bug eye in America) and it seemed huge by comparison. I was 20 years old at the time, and the Berk was the start of a life long sports car love affair for both of us. Dad died in 1990, but I am still feeling the effects of his love of fun-to-drive cars with my NSX. A very interesting and informative site especially as I was a T60 owner. I would have gone on to a B95 but formed the opinion that the company left too much of the road testing to the customer. The T60 was not too bad in this respect but I never saw a B95 that did not need it's engine bracing. I owned a Berkeley B95, which was my first car, between 1964 to 1965. Unfortunately, I can hardly remember a single journey being completed without some mechanical problem being encountered. However, the Berkeley still holds a fascination for me and I am very pleased to have found your site. I previously owned a Berkeley 4 wheel sports in the mid-1980's in Australia. I foolishly sold the car and now wish to find out if it is still in existence. Could you please give me any clues as to it's whereabouts? It was painted flame orange (nearly red..) and had big flared guards, and widened chromed wheels. I had sold it incomplete, but with a Suzuki Katana motor that I had planned to fit as the original engine was missing. It was sold in Melbourne, Victoria, and I have no idea where it would have finished up. I cannot find a chassis number in my records, but it should be quite easy to track down as there were only about 5 Berkeley's in Australia when I owned it back then. Any help would be much appreciated. Thank you. I am an old WW 2 paratrooper and was in England although I am an American, I loved it as I am of English descent. I Had a B95 in the early 60's and would like another. It was an absolute terror in gymkhanas!!!! I wanted to put large bike engine in it, but couldn't figure it out, loved it but the gel coat was beginning to crack badly, wish I could get a brand new one and start from scratch. Hello Colin, Good to hear from you. Yes, the Enfield engined cars were unreliable, the B95 less so, but they were incredibly fun to drive when they went. I think that this would have been improved if someone had thought of fitting an electric fan to stop overheating in traffic (some did... see the B95/105 page for pictures - ED). Like the London Underground, it relied on forward motion for cooling. Reading what you have said about the upgraded two stroke engines (ones with caged big ends and electronic ignition - ED), makes me hanker after a 492cc car, if one was available at a not too ridiculous price. By all means pass on my letter to the BEC, and feel free to give my email address to anyone else who wants to talk about these great little cars. I am in Spain at the moment in my camper van, which is what I usually do in the winter, although this year has been disappointingly wet and cold this time. I will leave next week for the south of France for the summer, hence the fr e-address. When I get there, I'll try and dig out a photo of my B105 for you (it had those naf fake knock on aluminium wheel covers), can't guarantee it, as a lot of my stuff got ruined when my basement garage got flooded a few years ago. I was an enthusiastic motorcyclist until a few years ago. When I lived in Italy I owned a Moto Guzzi 750S, on which I did about 50,000 miles, completing all my journeys, without any reliability problems. I also had a Guzzi Falcone, 500cc single built 1951, which I also used regularly for transport. Beautiful, except for the very feeble brakes. I sold both of them at a Brooks auction at Monaco and they ended up in Japan. I should have kept the Falcone. A friend of mine in the States put up a web page for me, he's a wiz at that kind of thing. If you've got nothing better to do, type in; www.autosportsltd.com then scroll down to "other peoples stuff", click on Jonathan Williams home page etc, and find out where I'm coming from. We need help/advice and where to buy parts. Have very gravely ill, neglected Berkeley. Was bought by the original owner, Eric Snowdon, at the 1958 Chicago Auto Show. We got it from his widow. It has been at our house for about 10 years, and now we are ready to restore it. I just found your web site, Brings back memories. I had a T60 while I was at University (UKC '75 - '78). I got it in '77, I think. I sold it around 1980 but I forget whom too. If I could recall the licence plate I would tell you, otherwise... If you have seen a Green T60 with some red-rust paint on it, then that was mine. The day I purchased it, it was raining cat-n-dogs and I drove it back from somewhere West of London to Canterbury. It was a long drive and I realized 1/2 way into it, that I really knew very little about the T60 and if it broke down, I would be in trouble. It didn't. As I was a bike rider, the T60 was a dream. No heat? No problem! I don't really recall how many miles I did, but lets just say... I didn't push the envelope with it. I had some major issues with the exhaust pipes (it fell off while crossing a train track) and didn't have much money to fit it. It was quite noisy for a while! I shared the web pages friends and family but all that did was confirm my somewhat crazy past with all of them. Very Informative & well presented site - congratulations. I Idly put in the word "berkeley" tonight into google and your site popped up. Had a very special tuned, lowered (yes true!) 495 in the 60s. Much modified by an ex Tony Brookes mechanic - came with a signed certificate saying it had been timed at 110 (or something similar) over a measured mile at Brands Hatch. Absolutely lethal - I had to sell it when I entered a field backwards at speed - my girlfriend (now my wife) made me part with it (for £150) and buy something sensible - so I did a Morris Minor Van for £100 & a 1933 Alvis Speed 20 VDP Coupe in bits for £45, but that's another story. I wonder if anyone has ever seen it? Distinguishing feature - rear alloy tank with fly off filler. I sprayed it red with a white hardtop and it went to a young trainee solicitor - I hope he survived!